Frederick W. Packtmann and Herman F. Pachtmann. Was in the partnerships of Huntington & Packard with Richard Huntington 1811-1814; Packard & Brown c. 1815; and Packard & Scofield with Salmon Scofield 1818-1819. The partnership of Palmer & Bachelders was formed in 1846 by Julius Palmer, Augustus E. Bachelder, Isaac M. Bachelder and Josiah Bachelder. Palmer's son Jacob P. Palmer joined the firm c. 1856 to become Palmers & Bachelders. Additional partners joined in 1864 and it became known as Palmer, Bachelder & Co. 1864-1884. Abraham Palmer & William Owen. John C. Palmer and Walter J. Ramsay. Abraham Palmer and Henry R. Smith. Palmer & Hanks with G.L. Hanks 1839-1840. Palmer & Smith with Henry R. Smith 1844-1846. Palmer & Owen with William Owen 1849-1859. In the partnership of Hampton & Palmer with James B. Hampton 1830-1832 in Salisbury and Palmer & Ramsay with Walter J. Ramsey 1847-1855. Silversmith and jeweler, he also ran a daguerreotype gallery and was one of the first early photographers in North Carolina. Amos Pangborn and James Edgar Brinsmaid. Succeeded by J.E. Brinsmaid & Bros.
Was in the firm of Pangborn & Brinsmaid 1833-1843.
side of the mark shown at right. Was a partner in the business of Otto Parisien & Son with his father Otto De Parisen 1785-1790. Marks may have been used by both David and Philip Parisen. Was in the partnership of Otto Parisen & Son with son Daniel Parisen 1785-1790 and then with son Philip Parisen 1789-1790. Was a partner in the business of Otto Parisien & Son with his father Otto De Parisen 1789-1790. 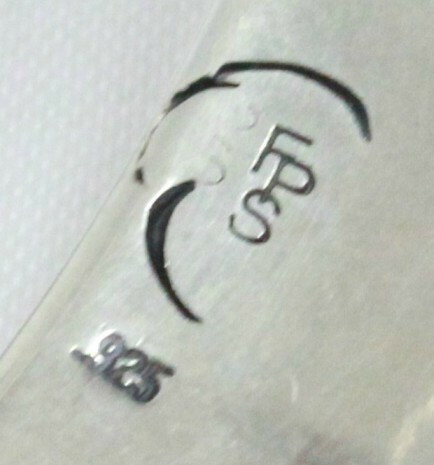 Marks may have been used by both David and Philip Parisen. Founded by Jacob Sherman as a torch and carbide miner's lamp manufacturer. Makers of smoking and desk accessories and a wide array of articles in a variety of metals, including sterling and gold. Acquired by Ketcham & McDougall in 1960, the company was moved to Murfreesboro, TN and the name was changed to Park Industries. Successor to the Hayden Mfg. 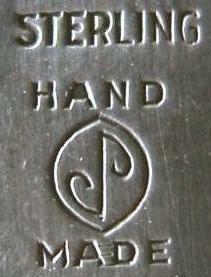 Co. Their maker's mark for sterling items is an anchor. The anchor with the Hope Silver Co. marking as shown to the right is the trade name for their line of silverplate goods. Reached the rank of captain while serving in the Revolutionary War. Was a partner in the firm of Bailey & Parmenter with Bradbury Melon Bailey 1871-1875. Rowland Perry and James Musgrave. Was a partner in the firm of Parry & Musgrave 1792-1795. Highly acclaimed Italian born silversmith who, with his brother Carmelo Patania, opened the Thunderbird Shop in Santa Fe, NM in 1927. The Tucson, AZ, store was added in 1937. Well known for Native American style jewelry, Frank Patania also made boxes and small items along with some flatware. Trained by Frank Patania, Sr., he went to work with him in the Thunderbird Shop and continued to operate the shop after his father's death in 1964. Opened the Frank Patania Store in Santa Fe, NM. Maker of a wide array of silver items, including jewelry, flatware, boxes, and ecclesiastic items. Grandson of Frank Patania, Sr., he renamed the Thunderbird Shop in 1996 to Patania's Sterling Silver Originals. Primarily makes jewelry. Maker of western belt buckles and small items. Handwrought jewelry, holloware, and miscellaneous items done in the modernist style. John W. Paxton and his son Daniel James Paxton. Was in the partnership of J.W. Paxton & Son with his son Daniel J. Paxton 1854-1865. Upon John Paxton's death in 1865, another son, William C. Paxton, joined the firm; the name was changed at that time to J.W. Paxton & Sons and continued until 1886. Charles Paye and Frank Baker. Successors to Simmons & Paye. Makers of a small line of sterling flatware, holloware, novelty items and souvenir spoons. Flatware production ceased c. 1920. Flatware Patterns by Paye & Baker Manufacturing Co.